Team Mousetalgia takes you to the blue carpet and the world premiere of Tomorrowland in this week’s episode! Join Jeff and Dave as they watch the celebrities descend on Downtown Disney’s AMC multiplex to watch Brad Bird’s fascinating new movie and report on the goings on. Jeff joins D23 to attend the private after-party in Disneyland’s Tomorrowland, and Dave joins in to report from a Lucasfilm screening of the film days later, and we offer our initial spoiler-free impressions of the film. Also, we talk Avengers, and offer some thoughts about the latest installment in the Marvel cinematic pantheon. Next: the Haunted Mansion welcomes back the Hat Box Ghost after nearly 46 years, and we offer our thoughts and responses to the new character, brought back to life with a little digital pixie (or is that mummy?) dust. 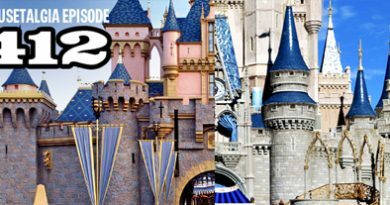 Plus – the Pacific Northwest Mouse Meet announces the special guests for this year’s event, the D23 Expo starts spilling secrets – and more!